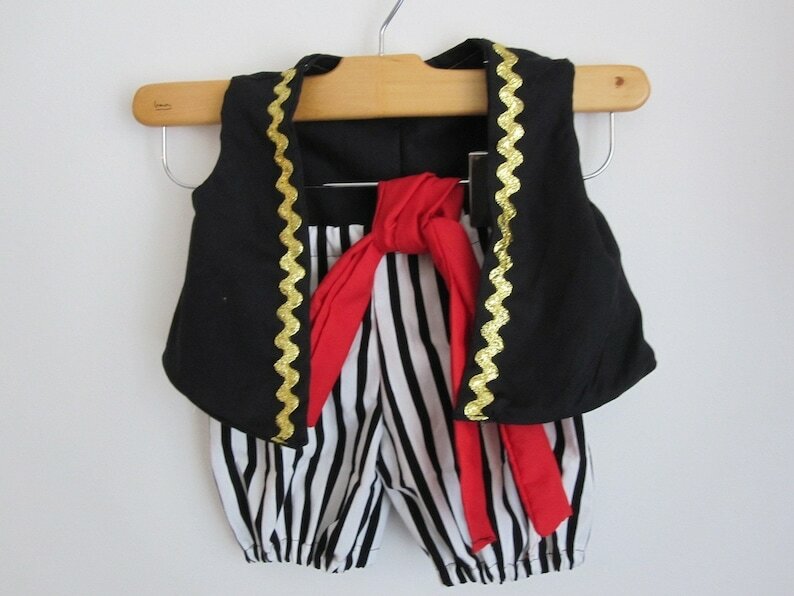 Perfect for your little pirate's everyday make believe adventures, birthday parties or Halloween-ing. The vest is detailed with gold trim and fully lined, just add an eye patch and some jewelry and you've got it set (I found some at Walmart for cheap) It would even be cute with little leggings and a long sleeve top for chillier days. And when you're finished just throw it in the laundry however you like, no fuss needed. Pirate girl costume in the last picture sold separately. The costume can be made in the following custom sizes. To order a size not listed in the drop down menu please message BEFORE ordering about the possibility of a custom order. Otherwise please select from the drop down menu. If you prefer a different measurement for the size you order just let me know when you check out. Please allow up to 3 weeks for your order to be created before shipping. Another option if you are pinched for time, unsure of size or your friend's personal taste is giving a gift certificate. For information see the gift certificate listing or profile.